At Beautifully Rooted, I wrote out some thoughts about the wonder of a huge God coming as a baby to redeem the world. A seismic shift for the entire planet took place. I hope you will go read some more of this post and leave a comment over there testifying of what God has shown you about His birth on earth. 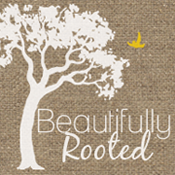 Your post on beautifully rooted today was wonderful! This Christmas I'm trying to spend a bit of extra time pondering the miracle in Christmas and all the spiritual meaning behind it. Loved your thoughts on the subject. Thanks for sharing!